Welcome to Visible Monday #160! If you want to participate, it’s so easy: just go to the bottom of this post for the how-to. Please be kind and leave a link to Not Dead Yet Style in your post. This cotton jacquard sheath dress is one of my favorites. It surprised me, because it was stiff when I first bought it at GAP (similar) for under $25. But a few washings later and it’s getting friendly. I like to wear it around town, to our favorite pubs and shops, and always with comfortable shoes (Calvin Klein oxfords, sim). You can see it below, dressed up and warmed up with a thrifted navy blazer (sim) and belt. And of course the fabulous necklace created by Suzanne Carillo and G-ring by Wendy Brandes. I feel visible and authentic, and enjoying my days. Wow… great outfit. Looking good and modern. Whoa, I nearly missed Visible Monday – what?? Arg, I’ve lost the ability to follow you since you moved your site. However, I’ve saved you in my Bookmarks bar (so low tech it’s scary). Lovely in blue, my dear Patti! Thank you for all these awesome peeps! Hiya, Patti ! You know your blues, lady … very nice combo (again … I will always love browns and blues. A new thing from this decade for me!) Not only is the dress a beauty (great fall-in-warm-climes) but so are you. You’re entering this great decade in fabulous style! Do I read your deadline right? Is VM now open ’til Thursday night? I hope so … as your slow-poke little buddy! I really like this dress + blazer combo, it’s perfect for the office! You’ve got the blues…and that’s not a bad thing!! Great shoes, Patti – and I like your new site. Particularly fond of the NYC skyline! So go to participate one more time and to join you all. Patti, I love a shift dress–it’s one of my favorites. I too sometimes just simply wear them with a pair of brogues. Such comfy, classy shoes. What a cute outfit. We could be working side by side right now because this outfit is a regular for me in the library where I work. Thanks for Visible Monday Patti! Blue on blue couldn’t be more beautiful on you. So happy that you’re hosting Visible Monday every week. Thank you! Love the dress with the oxfords. Great call. And that lovely necklace – swoon. What a beautiful dress! I like it with the jacket and without. I don’t think I knew that The Gap had dresses. LOVE this blue floral dress on you, Patti. You look so comfortable and chic! Really cute dress; love the print. Also love your shoes. Cute and they look super comfy! Love you in blue Patti, such a pretty color and so cool with the oxfords, one of my fav type of shoe . Happy Monday! Love your blue on blue, Patti! One of my favorite combinations! And how can you beat the versatility of the sheath dress?! Always chic! Pretty dress, Patti and I love it belted with the jacket. Very classic! 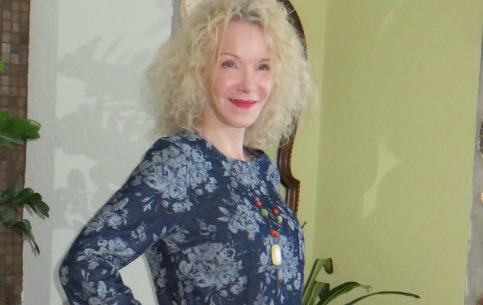 Monday’s are certainly not blue in your house with such a lovely outfit and smile to match. This dress fits you like a glove. Love the color and print. Great picks! Looking great as always, Patti! Love that necklace Suzanne made! love the blue on blue and you rock it! Oh, yeah, great gams there! I love this dress, belted but especially unbelted. And you’re wearing those shoes I love. And of course anything Suzanne touches comes out amazing, in this case your necklace. Thanks for hosting, Patti! This dress looks great on you! I like it belted. Well, if you pour a little vodka in the washing machine, all your clothes will loosen up. And they’ll really love you, man! This dress already loves you. Like Suzanne said, it’s a great length for you. Show those gams! This is such a great length on you Patti. I really like it belted. I guess you can’t wear too many layers there yet. Beautiful and comfy dress. Love the colour and the floral print! Looks great with a jacket over it too! Great dress! You look fabulous! I used to not wear dresses very often but am lately rediscovering all the dresses in my closet! And I love it when washing actually makes clothing better/more comfortable,etc! I just submitted my first post via my tumblr blog. Hope that’s ok. Such a pretty floral dress. It’s very “you” with your oxfords! I LOVE how your style the sheath dress with brogues Patti! Ah, isn’t it grand when a boardy cotton softens up. My African tunics are beginning to get to that point. Love the oxfords. 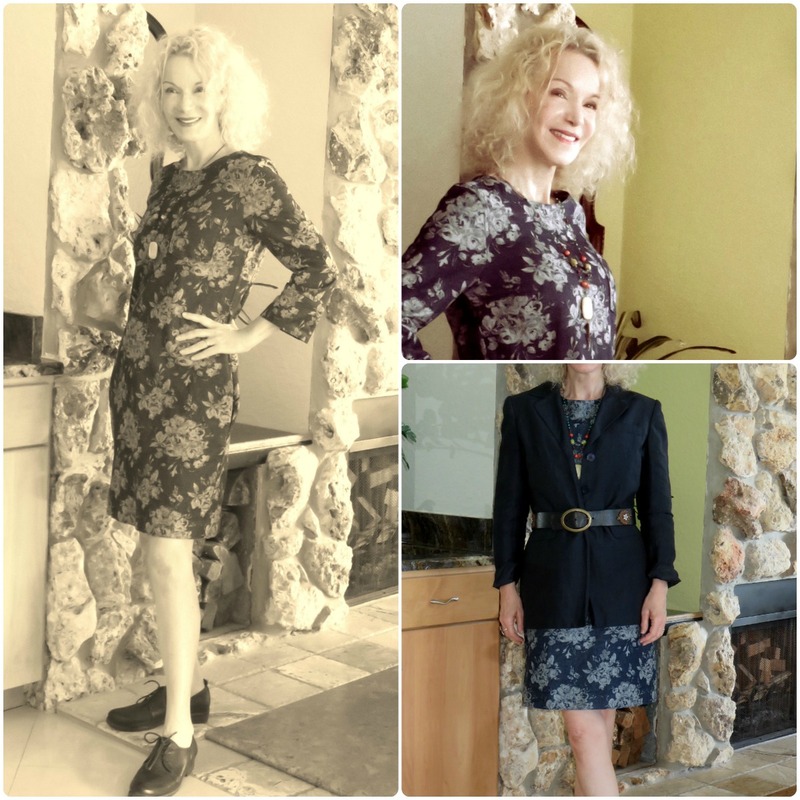 Thanks for the link up Patti…I really like your dress with the jacket and belted on top…nice look! Patti I have a couple of weeks away and everything changes… I LOVE the new-look blog, the design is fantastic!! Also loving the style of this dress on you: The shape suits your frame beautifully, and you always rock a masculine chic shoe or bootie. Thank you so much for hosting, hope to see you at #iwillweasrwhatilike tomorrow…! Love this cool and casual look. I’ve never thought of wearing oxford shoes with a dress 🙂 I might have to pick up a pair of these comfy shoes. It’s a nice dress, looks comfy and trendy, and seems very versatile. Have a great week, Patti! What a great, versatile dress! I have a few like this that I thought would be more comfortable to wear. Did you hand wash it or just throw it in the machine with a regular load?